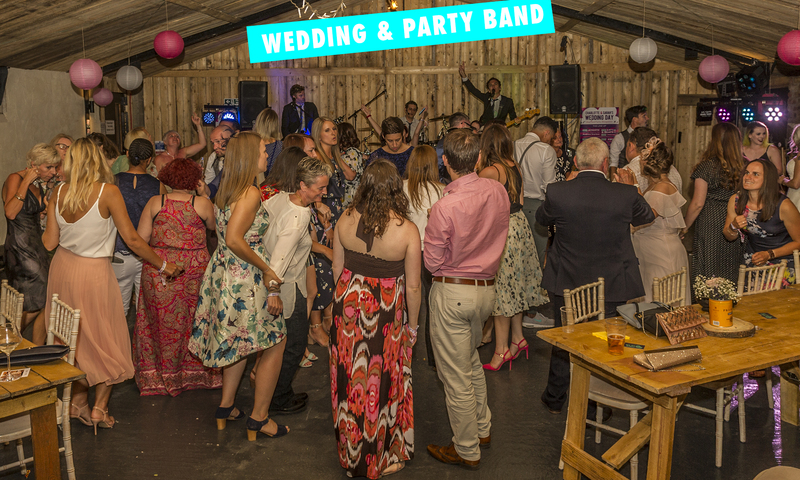 Midlands Wedding Band – Weddings | Birthdays | Corporate Events | Parties | Fundraisers – Book early and save. Why No New Blogs Recently? How far into 2019 are we already? It’ll soon be 2020 (What will we call this decade? “The Twenties”? Again? Its going to get confusing isn’t it) so its time to get thinking about booking your wedding band, birthday party band or corporate event band for 2019, 2020 and beyond. As you trawl through our website you’ll see that there’s no band more capable of handling your live entertainment than ‘Punch The Air’. Being fully self contained with PA, lighting and iPad DJ services included you don’t need to bother booking any external services saving you both time and money. Get in touch with us now here and let us know what you need. Is there any other band out there proving what they do week in week out with professionally shot live videos as ‘Punch The Air’ do?…..We think not. We headed over to Conference Aston (Again) this year for Shakespeare Martineau’s corporate Christmas party (Our second year performing for them). Andy quickly edited this slideshow video together for you all to see so it would still be relevant over the Christmas period. Yes, its true, some folk do get married in December…and some also on a Thursday in December. We headed over to the lovely Mill Barns in Alveley, Bridgnorth during a very mild Thursday evening and performed songs both modern and new also including some Christmas tunes live for Hayley & Tom at their request. Below you will see them rocking out with us live on stage to Wham’s “Last Christmas”. 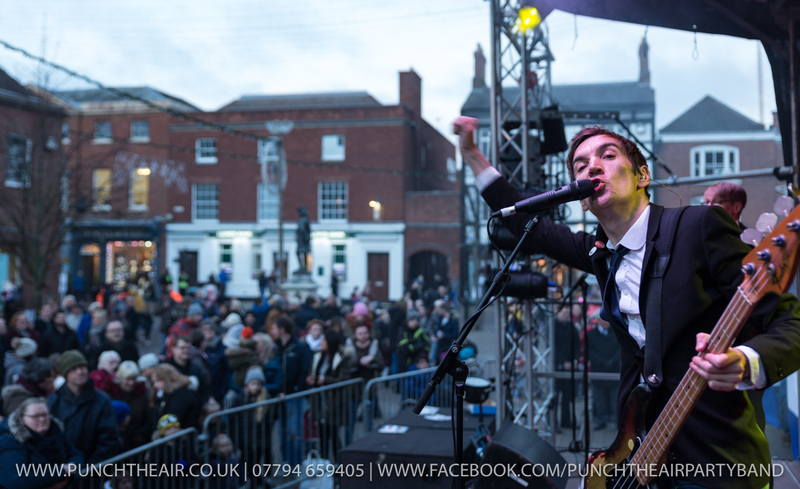 We performed at Lichfield Xmas Lights Switch on 25th Nov in Market Square to a strong crowd of over 4000. Lots of Christmas tunes and singalong party hits from modern day back to the 1970s were performed and everyone had a brilliant time. Its not too late (Or early) too book us for your Christmas party. Click here to find out more. A few weeks back Andy performed four gigs over the space of three days. He filmed the entire thing and has spent the last few weeks editing it up into a story about what we get up on a regular basis. Over the next 17 minutes you can view things from our perspective, hear many client testimonials and see the fun everyone has at our live performances. Why would you book any other band for your special day or event? Clearly its not as we still have more weddings booked in for the remaining months of 2018 than any other type of work (They even go up to the end of December). We’ve been that busy in 2018 that we’re struggling to edit all the brilliant videos and images we’ve taken over the summer months but we’ll hopefully get them all online soon. Metallic confetti cannons have been one of the most used wedding accessories this year and they really help to add a little extra sparkle to the venue (Even if you’re finding the pieces in your guitar case for weeks to come afterwards). Here’s a picture Andy took of one mid explosion. Speak to us about adding these fun accessories to your wedding when booking here. 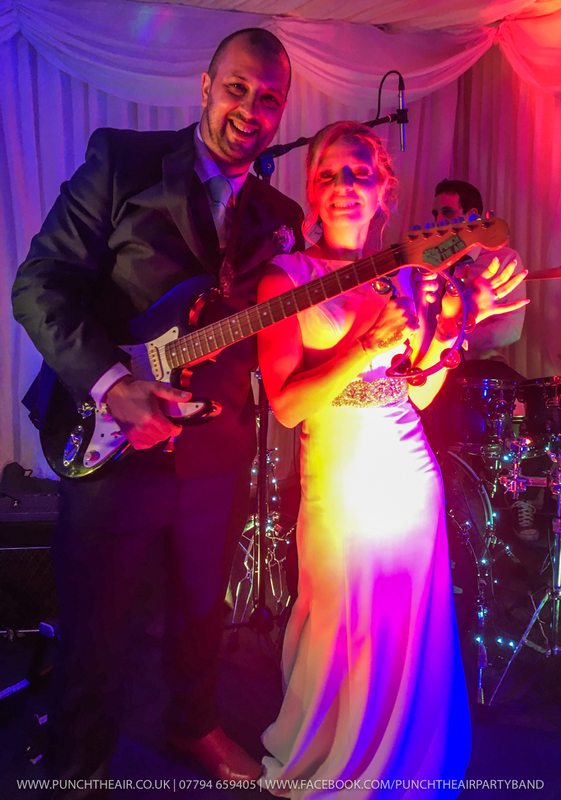 We love it when a bride and groom want to join us on stage and become rock & roll stars themselves, and Vicky & Ashley were exactly that. We also love to ham it up with clients big time. This video was crowd sourced and made up of “Fan footage” filmed by guests on their phone phones which was then combined with our camera footage and the audio from our desk. Andy & Matt returned to Birmingham Food Festival on the day that England beat Sweden two nil during the 2018 World Cup quarter finals and performed a set of crowd pleasing tunes which there are two videos of below. The second includes ‘Three Lions’ (Football’s Coming Home) which we performed for the first time ever together. Of course we had an amazing response from the crowd. Latest updates: We’re well into wedding season now and we do our best to try and capture as many photos from live performances as we can. If you head on over to our images page here you can see some of the weddings we’ve performed at this year. We’ve performed in the West Midlands, Derbyshire, Lancashire, Staffordshire, Shropshire and many other counties. We’ll travel anywhere in the UK to make your wedding or party a fantastic night you will never forget. 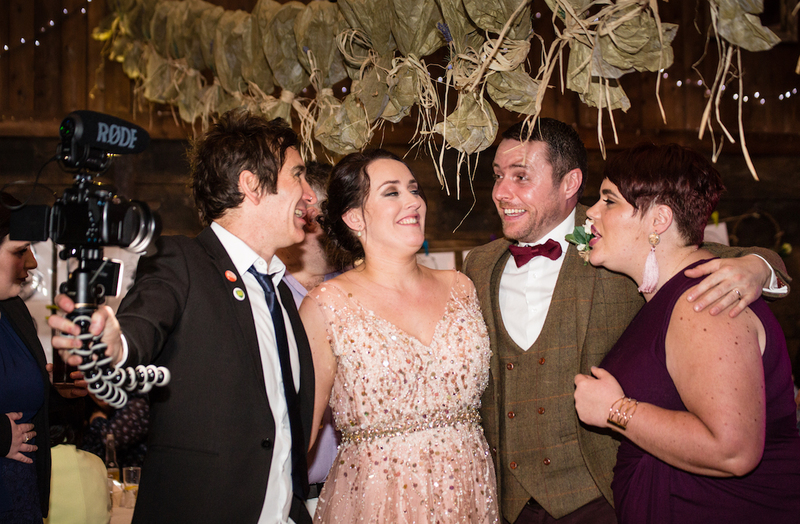 Latest updates: We’re very excited to present to you our latest Vlog from Rachel & Steves wedding at Lower Damgate Farm, Ashbourne, Derbyshire during April 2018. We had an absolutely brilliant time as did the bride and groom and all the guests. Everything in this video is 100% live. All the audio was recorded at the actual wedding and is exactly how it was performed live on the day. You can also view lots of photos from Rachel & Steves wedding here and images from other weddings we’ve done in 2018 & 2017 as well. You may or may not be aware that we’re now in the busiest time of the year for us as its now wedding season. So you will see a lot of new videos and photos of us performing live on this website shortly. We’re #AllAboutLive and everything you see and hear on this website will be 100% fully live. Ask yourself “Is this video I’m watching actually LIVE”? There’s a good chance if you’re NOT watching a ‘Punch The Air video’ then its just been recorded in a studio environment and then mimed to later. ‘Punch The Air’ are the only band constantly producing quality live videos and Vlogs so you can see exactly what we are like live and how well clients and their guests react to our fabulous performances. Below is our latest Vlog showing what we got up to at a recent wedding in the West Midlands. If you head on over to our Facebook page you’ll see lots more of what we do on a weekly basis. To contact us please click here for a quote, or call us on UK 07794 659405. 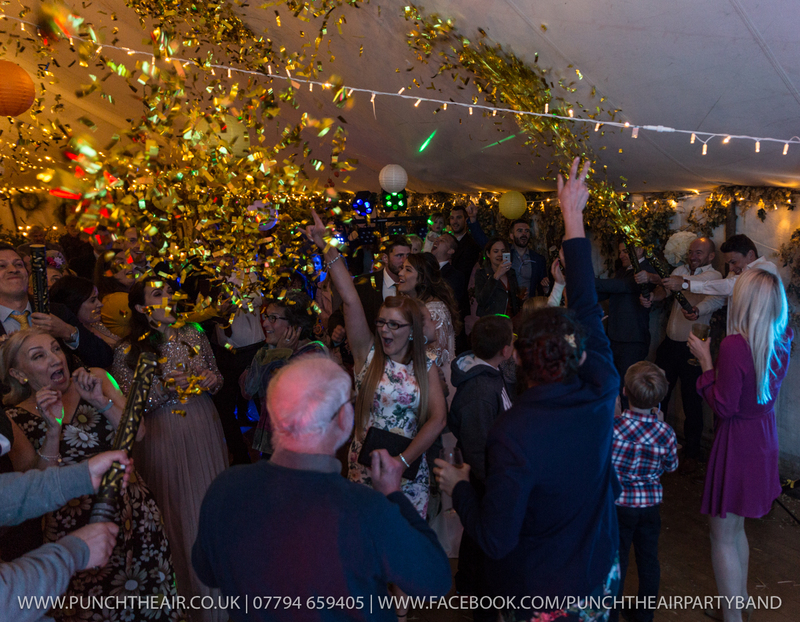 Punch The Air - Live party band available to hire for weddings, birthdays, corporate events, festivals, parties and more. I cannot recommend Punch the Air enough. I booked them for my 40th birthday and they made it a night to remember! Andy was brilliant and reassuring from the start. They were so professional beforehand with the booking, in setting up and tidying away but above all played some fantastic tunes that people could not resist dancing to. Everyone kept saying how good they were. My feet still ache from dancing so much nights later ! If you are considering booking them - do it - you will not regret it ! Thanks andy and the band for an unforgettable night. Fantastic experience from start to finish. Very efficient booking and professional set up through to an amazing set with everyone dancing and singing along. Top quality band playing top drawer music. This band is highly recommended. I've never seen a wedding band put as much effort into a performance like Punch The Air did last weekend. Guests just wouldn't let them leave the stage and everyone including myself was a sweaty mess come the end of the night. They played something for everyone from modern day back to Elvis and had every single guest up and dancing all night long. If you want your wedding to be the most memorable day ever then I highly recommend Punch The Air. Really great live band who bring the party to life with their delivery of songs across the decades. From Tiffany to Kings of Leon they provide something for everyone and will have you up on the dance floor throwing some shapes. I hired Punch The Air for my wife's Birthday Party. What more can I say than this band deliver! Highly professional and in the run-up to the event easy to work with. We had all ages at the party and their music catered for everyone. They had the dance floor full from start to finish. Highly entertaining!! I would recommend Punch The Air without any hesitation!! Absolutely Brilliant and Can’t recommend these guys enough, played at my friends wedding, came round chatting to guests and had them dancing all night.